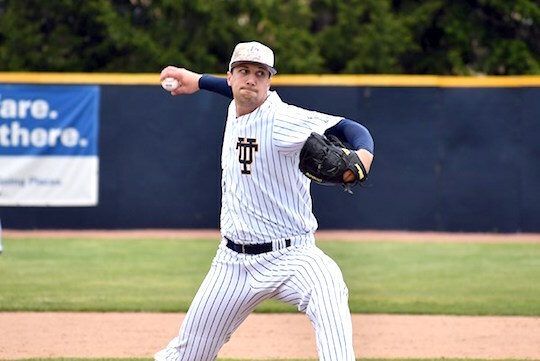 Toledo’s senior pitcher Sam Shutes was named National Pitcher of the Week by the National Collegiate Baseball Writers Association (NCBWA), the organization announced Tuesday. Shutes earns yet another accolade after his incredible two-hit, complete game shutout of Bowling Green last Friday. With the Rockets needing a win to keep their Mid-American Conference Tournament hopes alive, he threw the first complete game shutout by a UT pitcher since the 2014 season. He was dominant from start to finish, allowing just two hits and one walk while striking out nine. He retired the final 17 batters he faced, six by strikeout, and pitched to just two batters above the minimum. Shutes leads the league with 10 victories and 89.1 innings pitched, and his 3.12 ERA is fifth in the conference. Seven of his last nine starts have lasted at least seven innings, and he has five starts this season with at least six shutout innings. He has been especially dominant in conference play, posting a 1.96 ERA in 64.1 innings pitched; opposing MAC hitters are batting just .212 against him. Immediately after Shutes threw his complete game shutout, teammate Michael Jacob went out and threw one himself, giving Toledo back-to-back incredible pitching performances to end the regular season. The Rockets earned the No. 5 seed in this week’s MAC Tournament thanks in large part to stellar outings by Shutes and Jacob. Shutes also was named All-MAC for the first time in his career Tuesday, joining Ross Adolph and John Servello as MAC award winners for Toledo. He was named a national player of the week by Collegiate Baseball and was CollegeSportsMadness.com’s MAC Player of the Week as well. Toledo will begin its MAC Tournament run Wednesday, May 23. The Rockets will play No. 4 Central Michigan at 6 p.m. at Sprenger Stadium in Avon, Ohio. This entry was posted on Wednesday, May 23rd, 2018 at 3:16 am and is filed under Athletics, News .